Interview with Simon Taufel – Cricket Umpire | The International Cricket Hall of Fame. 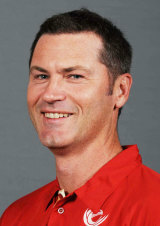 Simon Taufel is an Australian umpire that currently sits on the ICC Elite umpire panel. Simon has also won the ICC Umpire of the Year award five consecutive times between 2004 and 2008. How long have you been an umpire? My first season as an umpire was in 1991/92 with the NSWCU&SA in Sydney. So, at this point I’m just short at 20 years on the field as an umpire. What made you want to be an umpire? I stopped playing cricket the year before due to a back injury while representing the Mosman CC. I did not seek to become a cricket umpire, but a good cricket teammate of mine from another club, David Budge, twisted my arm to join him to attend an umpiring course with the NSWCU&SA in the city. After some hesitation, I decided to join him and do the course. When it came to exam time, I managed to surpass the 85% pass mark and David failed it. So, I decided to take up umpiring and David went back to play cricket – so, I suppose umpiring chose me rather than I chose umpiring and the rest is history. What would you say are the positives and negatives of the job? These positives and negatives change a little as your career progresses, but at the present moment the positives would be…representing your Association, State, Country and family, seeing some great countries and places of interest, meeting wonderful people from different cultures and religion, the variety of the role, seeing some great cricket and performances on special grounds, being part of cricket history and performing at the highest level in a sport. There aren’t too many negatives, but being away from home and my family for such long periods of time would have to be the biggest one. Being shot at in Lahore would have to be another one! No one should have to have their life jeopardised by simply participating in a game of cricket. What character traits do the best umpires have? Some of the more successful character traits of umpires include good listening skills, patience, empathy for others, acceptance, pride and a great deal of self belief. What are some of the difficulties you face on the pitch? Meeting and exceeding the expectations of players, media, spectators and administrators. We all have our good and bad days with decision making, but the focus for me is doing my best and improving with each performance. As technology improves and broadcasters introduce new tools, the scrutiny on decisions increases – so the growing challenge is to beat the video replay. How do you deal with the difficult players on the pitch? Try to see things from their perspective and understand their problem. Listen to their issue, and deal with the problem rather than deal with the difficult player. Above all, respect that it is a players’ game and manage the game in a fair and consistent game for all players. In your experience, is it a different experience umpiring a test match compared to an ODI? Test match cricket is called a Test for a reason! It is the ultimate test of character, umpiring ability, technique, stamina and decision making skills. One-day cricket can be more of a challenge in the areas of managing distractions off the field, for example hearing things on the field as the crowds tend to be bigger, music and fireworks. With day/night matches there is a challenge of not starting a match until mid afternoon, seeing the ball in twilight and late finishes which impacts on sleep patterns with travel demands. What role does the umpire play in ensuring that the game is played in the right spirit? The umpires need to have a strong, professional working relationship with the two captains. The umpires also have to work as a team, perform their duties and communicate as a team. They need to work with the Captains and players in a respectful way while applying Laws and Playing Conditions in a fair and consistent way. What do you think about the technology that is used in the game? Video replay, Hawk-eye, stump cam etc. Do you think it undermines the role of an umpire? Is the referral system a positive tool for the game? Technology is an important element in the game today – it is here to stay. The challenge for umpires and the sport is to use technology in the best way that is consistent with how we want to play the game. There is no right and wrong answers here as it all depends on how we want to play the game. Technology shows that the umpires at the highest level on average get around 95% of their decisions correct, which is a pretty good number in any sport for match officials. The challenge is how do we improve this statistic for the players and technology has a role to play here. Should players be the ones who ask an umpire to review his own decision? Not in my view. Personally, I think the players should play and the umpires should umpire. The role of a Captain is tough enough today without asking them to be the judge as to whether to challenge an umpire’s decision. There will always be a role for umpires in the game as umpiring is so much more than giving outs and not outs. The challenge for us is to see what the best way of using technology is without compromising the great values and spirit of cricket. What are the best character traits for someone aspiring to be an umpire?